Bob Coffield sent me a invitation to participate in a Thanksgiving Blog Rally being led by Paul Levy, CEO of Beth Israel Deaconess Medical Center in Boston and author of Running A Hospital Blog. I posted a template that came with the email and started to look at what Engage With Grace is all about. I encourage you to check out their web site at www.engagewithgrace. But this subject really got me thinking. This past Sunday during the #HCSM chat on Twitter I was reminded of the difficult death of my mother after a struggle with Alzheimer's disease. Then I watched CBS News 60 Minutes "The Cost of Dying." So this Thanksgiving Day I am considering life and death. I believe that our lives are a gift from God. And while I know that medical care has made some remarkable advances that allow us to live longer and healthier lives than ever before in history, sometimes keeping someone alive just for the sake of keeping them breathing may not be the best decision. But this is a deeply personal decision that I would never want to impose on another. That is why having these discussions with your loved ones is so important. Knowing our loved ones wishes is important when dealing with end of life issues. I have served as a Deacon and now as an Elder at Gateway Presbyterian Church. I have watched families struggle as they see their mother, father, brother, sister or their sons and daughters die. I have seen good deaths, where it was more of a joyful parting, and some very difficult times where things went terribly wrong. 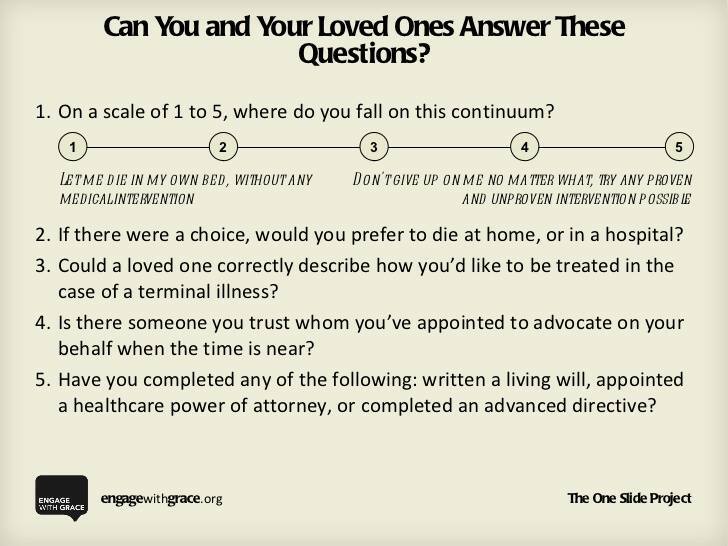 One thing that I think is critically important is that your family understand your wishes regarding end of life care. An Advance Directive is a great way to accomplish this. Ben Fry, Director of Seed Visualization, explains the work his team is doing to create visualization tools that make draw on GEs vast collection of six million patient records. To gain a deeper understanding of healthcare costs, GE combined the Medical Expenditure Panel Survey (MEPS) with 500K records from GE's proprietary database. By combining MEPS with GE's data, we gain a more complete picture of the costs associated with chronic conditions. Drag the slider to view different ages, and click the pie wedges for each disease. http://files.gecompany.com/healthymagination/visualization/health_cost/cost.zip All content on their site GE (including, without limitation, text, design, graphics, logos, icons, images, audio clips, downloads, interfaces, code and software, as well as the selection and arrangement thereof), is the exclusive property of and owned by GE, its licensors or its content providers and is protected by copyright, trademark and other applicable laws. You may access, copy, download and print the material contained on the site for your personal and non-commercial use, provided you do not modify or delete any copyright, trademark or other proprietary notice that appears on the material you access, copy, download or print. Any other use of content on the site, including but not limited to the modification, distribution, transmission, performance, broadcast, publication, uploading, licensing, reverse engineering, transfer or sale of, or the creation of derivative works from, any material, information, software, products or services obtained from the site, or use of the site for purposes competitive to GE, is expressly prohibited. With health care reform in the air, interest groups are spending huge sums of money to influence the final legislation and other matters pending in Washington. Since 2006, the health sector has spent $1.7 billion lobbying Congress and federal agencies — more money than any other sector of the economy. Between January and September 2009, health care interests spent $396.2 million (see Figure 1), according to federal data collected by the Center for Responsive Politics (www.opensecrets.org), a nonpartisan organization that researches the influence of money on politics. Figure 1. Top-Spending Sectors and Organizations Lobbying Congress and Federal Agencies, January to September 2009. Panel A shows the five top-spending sectors and spending by the health sector and the insurance industry. (The breakdown in health sector spending does not include that classified as miscellaneous health.) Panel B shows the six top-spending organizations overall and additional top-spending organizations in the health sector. The total amount of money spent on lobbying Congress and federal agencies was $2.5 billion. Data are from the Center for Responsive Politics and include all data made available by the Senate Office of Public Records through October 2009. HMO denotes health maintenance organization, and PhRMA Pharmaceutical Research and Manufacturers of America. If current trends continue, the health sector is likely to spend more than a half-billion dollars on lobbying in 2009. Pharmaceutical and health care products companies alone are likely to spend more than $250 million, and the insurance industry, which is part of another sector, more than $160 million. In all cases, these would be record annual expenditures. The Center for Responsive Politics notes that “a special interest’s lobbying activity may go up or down over time, depending on how much attention the federal government is giving their issues.” Of course, the billions of dollars that health care interests stand to gain or lose because of health care reform and other federal actions dwarf their lobbying expenditures. As the Obama administration has focused on health care, it has engaged in discussions with drug and medical device companies, health insurers, physicians, hospitals, business groups, labor groups, and many other parties. Dozens of contentious issues have kept interest groups busy, including the role of comparative-effectiveness research in coverage decisions, government negotiation of Medicare drug prices, the targeting of additional Medicare savings, and the size of the program’s payments to doctors. There has also been debate on many other topics, including mandates for obtaining health insurance, the creation of a national public health insurance plan that would compete against private carriers, coverage of abortion, other specifics of health insurance reform, the market-exclusivity period for biologic drug products, and new fees, taxes, and tax credits. The health sector has historically spent substantially more money lobbying Congress and federal agencies than it has on campaign contributions.4 These expenditures complement each other; whereas lobbying is directed at government officials and often involves specific matters, campaign contributions are for elections and may be sent to any candidate, not just incumbents. Nonetheless, as health care interests have increased their lobbying expenditures, they have also reversed their long-standing pattern of favoring Republican candidates in federal elections.5 During the first 9 months of the 2-year 2010 election cycle, the health sector — as well as the insurance industry — contributed more money to Democrats than to Republicans (see Figure 2). In some races, this shift could make a difference. Figure 2. Contributions from the Health Sector (Panel A) and Insurance Industry (Panel B) to Federal Elections, January 2004–October 2009. The health sector consists of health care professionals, pharmaceutical and health care product companies, hospitals and nursing homes, and health services and health maintenance organizations. Election cycles represent 2-year periods; the 2010 election cycle runs from January 1, 2009, to December 31, 2010. PAC denotes political action committee. Data are from the Center for Responsive Politics and include all data made available by the Federal Election Commission through mid-November 2009. Campaign contributions represent the combined total of individual contributions and those from political action committees (PACs). The federal limit for an individual is $2,300 per candidate per election; primary and general elections are considered separate elections. The Center for Responsive Politics examines the campaign finance data reported to the Federal Election Commission and categorizes contributions of $200 or more from individual donors or PACs into 13 sectors of the economy. In the 2008 election cycle, the sector comprising the finance, insurance, and real estate industries ranked first in campaign contributions, and the health sector ranked sixth. For all federal elections, the health sector donated more to Democrats (54%) than to Republicans (46%), and the insurance industry donated more to Republicans (55%) than to Democrats (45%). Before 2008, the last time that Democrats raised more than Republicans did from health care interests was 1992, when Bill Clinton was elected president, and the last time they raised more from the insurance industry was for the 1990 Congressional elections. So far in the 2010 election cycle, the Democrats’ fund-raising advantage has increased. The health sector has sent 59% of its contributions to Democrats and 41% to Republicans; the insurance industry has split its contributions 54% for Democrats and 46% for Republicans. The Democrats have a broad advantage; they have received 57% of the contributions from the pharmaceutical and health care products industries, 71% of those from hospitals and nursing homes, and 55% of those from health care professionals (including physicians and nurses). The early data for 2010 primarily reflect donations from PACs, which account for about half of contributions from the health sector and about two thirds of contributions from insurers. Notably, the health sector has contributed more than any other sector to House Speaker Nancy Pelosi (D-CA) and to House Majority Leader Steny Hoyer (D-MD), most of which is from PACs. In the Senate, Majority Leader Harry Reid (D-NV) has been the top recipient of contributions from health care professionals as well as from hospitals and nursing homes. There are many possible explanations for the Democrats’ fund-raising advantage. They include Democratic control of the White House and Congress, the extent to which federal funding and regulation of health care and health insurance are in flux, the efforts of health care interests to maintain their access to and influence with Congressional leaders and the White House, and the health care reforms that the Obama administration has — and those that it has not — pursued. Of course, donors often hedge their bets by contributing to both parties. And the 2010 Congressional elections are a year away; more individual contributions are likely, and the distribution between the parties could change. Dr. Steinbrook (rsteinbrook@attglobal.net ) is a national correspondent for the Journal. This article (10.1056/NEJMp0910879) was published on November 18, 2009, at NEJM.org. “The Cost of Dying,” which aired Nov. 22 on CBS News’ 60 Minutes explores the incredible amount of money spent on healthcare at the very end of people’s lives. It was an extremely timely and valuable program. As end of life care is brought to the forefront of the health reform debate, it is worth taking some time to watch the video below. In 2008, Medicare paid $50 billion for doctor and hospital bills during the last two months of patients' lives – with as much as 20 to 30 percent deemed to have had no meaningful impact, Steve Kroft reported. One of her doctors, Dr. Ira Byock, who heads the palliative care program at Dartmouth-Hitchcock Medical Center (DHMC) in Lebanon, NH., told 60 Minutes correspondent Steve Kroft it costs up to $10,000 a day to maintain someone in the intensive care unit. Some patients remain here for weeks or even months; one has been in the ICU since May. "This is the way so many Americans die. Something like 18 to 20 percent of Americans spend their last days in an ICU," Byock said. "And, you know, it's extremely expensive. It's uncomfortable. Many times they have to be sedated so that they don't reflexively pull out a tube, or sometimes their hands are restrained. This is not the way most people would want to spend their last days of life. And yet this has become almost the medical last rites for people as they die." "Families cannot imagine there could be anything worse than their loved one dying," said Byock. "But in fact, there are things worse. Most generally, it's having someone you love die badly - dying, suffering, dying connected to machines." After we finished this story, we received word that Charlie Haggart, the patient who was hoping for a liver and kidney transplant, died this week at a hospital in Vermont. His brother said Haggart's condition had deteriorated so much the family decided that no attempts would be made to resuscitate him. Below is the report "Hospital computing and the costs and quality of care: a national study," by David U. Himmelstein, M.D., Adam Wright, Ph.D., and Steffie Woolhandler, M.D., M.P.H., published in The American Journal of Medicine. At the Web 2.0 Expo 2009 in New York City Tim O’Reilly had an amazing conversation with Beth Noveck, United States Deputy Chief Technology Officer for Open Government. She is on leave as a professor law and director of the Institute for Information Law and Policy at New York Law School and McClatchy visiting professor of communication at Stanford University. Dr. Noveck taught in the areas of intellectual property, technology and first amendment law and founded the law school’s "Do Tank," a legal and software R&D lab focused on developing technologies and policies to promote open government.